In case I haven’t said it already, I love cupcakes. I really do. And I love Ireland and most things Irish. So the combination of the two should be perfect, right? Bzzzzzt. Wrong. But far be it from me to keep from sharing, just because I don’t actually like something. I’m selfless like that. 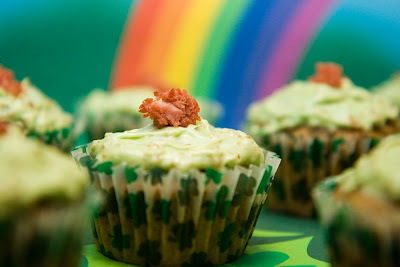 With St Patrick’s Day just around the corner, you might be inspired to whip up a batch of these corned beef & cabbage cupcakes from Cupcake Project. Yep, they’re corned beef and cabbage. And they’re cupcakes. The meat is in the cake and the vegetables are in the frosting. With ground corned beef on the top, where you might normally expect a cherry. Mmmmmm. If you’d like the recipe for this or lots of other cupcakes, check out Cupcake Project. Posted in Food sparks, WWWhat? I know. I wasn’t sure though – it’s been a while since I visited, so thought maybe these were all the rage in Dublin baking!